People are always talking about the great nightlife in Ballard, the cutting edge restaurants, the Ballard Market. But I’m here to tell you about the delicious breakfasts to be had-mainly the kind that are filled with good old fashioned filling carbs. 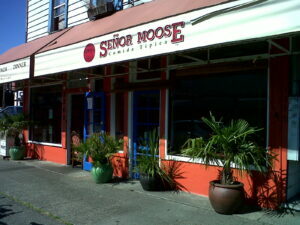 Senor Moose. Photo by Joan Magnano-Damm. I think the best French toast in town is at Senor Moose Café, at 5242 Leary Avenue NW, a café that has been written up in the New York Times for dinner, but it’s their French toast that has me salivating days before I know we’re going. Made of thick hunks of whole wheat bread, darkly browned, fluffy on the inside and sprinkled with a light dusting of powdered sugar. It’s a “healthy” French toast served with a generous portion of syrup and butter. The warm pastel décor with colorful artwork makes me feel as if I’m in a café in Mexico. Scrumptious! The Hi-Life. Photo by Joan Magnano-Damm. The Hi-Life is up the street, at 5425 Russell Avenue NW, and I go there for the whole wheat blueberry pancakes served with butter and syrup, although the serving of syrup is skimpy. I always ask for more. But the pancakes are sheer heaven with a strong whole wheat taste and the fresh sweet blueberries ooze as the perfect accompaniment. 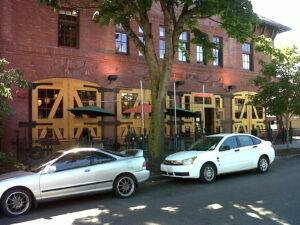 Over the Ballard Bridge you’ll find Chinook’s, 1900 W. Nickerson Street, #103, at Fishermen’s Terminal. A popular meeting place known more for the all-you-can-eat fish ‘n’ chips on Monday nights, but I love their buttermilk waffles served with bacon. The waffle is always consistent – thick, round, filling and comforting. The outside views makes me feel like I’m dining in Haines, Alaska, eating among the fishing trawlers under the Ballard Bridge. An added bonus is the scones served warm with an orange butter. They come wrapped in a festive red and white picnic table paper. French toast, pancakes and waffles. 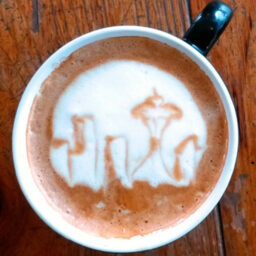 That’s what I think of when I think of a Ballard Breakfast.